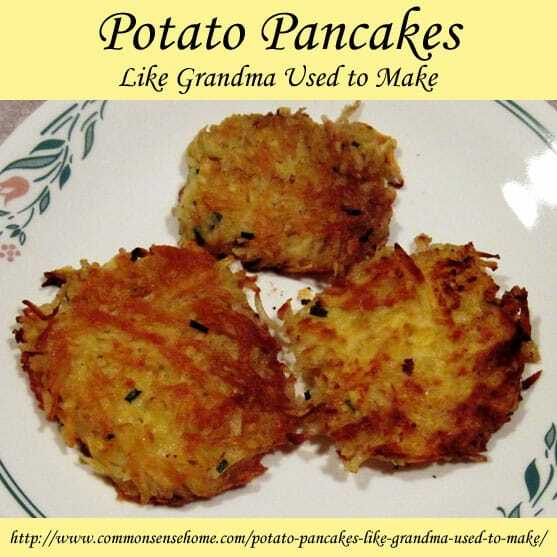 When I was a little girl, I remember my grandmother making potato pancakes quite regularly, usually on Friday nights. (Potatoes were cheap, and stored well in grandma's unheated basement.) Mom made them sometimes, too, for the same reason. Both mom and grandma always served their pancakes with homemade applesauce (and I do, too :-). When I was flipping through my copy of The Garden Fresh Vegetable Cookbook by Andrea Chesman, I came across her recipe for potato latkes, which were pretty darn similar to grandma's potato pancakes. Now that the days are getting cooler and the new crop of potatoes are coming in, I thought it was a perfect time to share my favorite recipe for potato pancakes, which is somewhat of a hybrid of Andrea's and my grandma's. Grate the potatoes, either by hand or with a food processor. 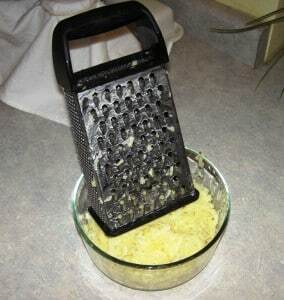 Usually I just do it by hand, because my friend, Julie, got me this nifty box grater, which is very handy, plus it's quieter than the food processor and easier to clean up. As you grate the potatoes, move them into water acidified with either lemon juice or vinegar (1 tablespoon lemon juice or vinegar to 4 cups water). (This is Andrea's tip.) Mix potato with water for one minute, pour into a strainer and drain well. (At this point she pats them dry with a kitchen towel – I skip this step.) Acidification will keep the potatoes from turning pink, then gray as they oxidize with exposure to air. In a large bowl, mix together all ingredients except butter and applesauce. Heat your skillet up to medium-high, and lube it up with plenty of butter. (Don't skip on the butter – fat adds flavor and butter is good for you – honest.) Drop the potato mixture in the pan about 1/4 cup at a time. Fry until golden brown on the bottom, 1 1/2 to 2 minutes. Flip, repeat. Give each pancake plenty of room so you get nice, crispy edges. You can keep the pancakes warm in the oven while you finish cooking, or you can just start dishing them up as you go (my preferred option). If they sit too long, they loose that crispy goodness. Serve with applesauce (or ketchup, if you think that's a food group like my youngest son). These are pretty tasty warmed up (in the toaster oven or frying pan) the next day for breakfast, too, or even eaten cold. Note: For a thicker batter, you can add a few tablespoons of flour or teaspoons of cornstarch to act as a binder. This will help the pancakes hold together better. Sometimes if the potatoes have a high water content (for instance, if we had a lot of rain before harvest), the pancakes don't hold together as well. Well, it's way past my bedtime, the canner just dropped to zero pressure, and you should have the information you need to make some pretty tasty potato pancakes. These easy potato pancakes make a quick and delicious meal. Grate the potatoes, either by hand or with a food processor. As you grate the potatoes, move them into water acidified with either lemon juice or vinegar (1 tablespoon lemon juice or vinegar to 4 cups water). Heat your skillet up to medium-high, and lube it up with plenty of butter or fat of your choice. Drop the potato mixture in the pan about 1/4 cup at a time. Fry until golden brown on the bottom, 1 1/2 to 2 minutes. Flip, repeat. Give each pancake plenty of room so you get nice, crispy edges. You can keep the pancakes warm in the oven while you finish cooking, or you can just start dishing them up as you go (my preferred option). If they sit too long, they loose that crispy goodness. Serve with applesauce (or ketchup, if you think that’s a food group like my youngest son). These are pretty tasty warmed up (in the toaster oven or frying pan) the next day for breakfast, too, or even eaten cold. For a thicker batter, you can add a few tablespoons of flour or teaspoons of cornstarch to act as a binder. This will help the pancakes hold together better. Sometimes if the potatoes have a high water content (for instance, if we had a lot of rain before harvest), the pancakes don’t hold together as well. 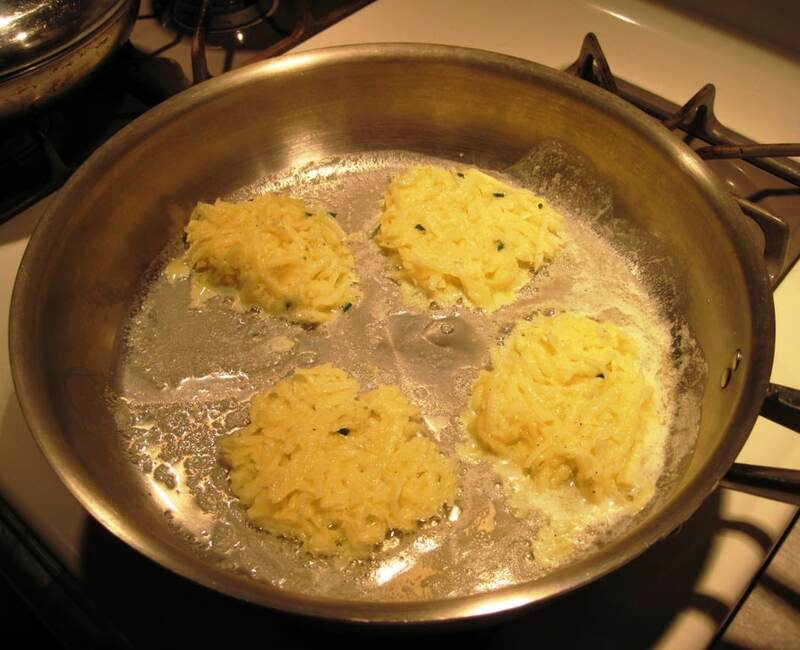 Potato pancakes…one of my favorite foods. I also add a little grated carrots to my potato pancakes to get a little more nutrition in them. Also, we enjoy them topped with a dollup of sour cream. Reading this makes me want to make some right now! Make sure your potatoes are well drained, and add a little more flour or an extra egg, or both. Do we need to add flour in the recipe? Or only if they fall apart? Only if they fall apart. Sometimes the potatoes will be higher in moisture, and the batter will just get runny, even if they are drained and patted dry. I just clarified this in the recipe. Love potato pancakes! Shredded or left over mashed potatoes! I do have a question, how do you identify a starchy potato vs waxy potato? Thanks! Love your site! When you boil a starchy potato, it will look mealy or starchy on the surface. It has a drier mouth feel. Waxy potatoes tend to be more firm, and will sometimes have an almost glossy finish. Russets are a classic starchy potato. Spring new potatoes are a waxy potato. Many fingerlings are waxy potatoes. It’s not that waxy potatoes won’t work at all, it’s just that the starchier potatoes give off the starch that binds the cake together. If you used a waxy potato, you’d need added starch of some sort for sure. These are great with poached eggs on top. They store well in the fridge and then reheated/’recrisped’ in the toaster oven while I poach the eggs. Mmmmmm.